What do my fellow huddlers think will go down on Saturday? This is a monumental game considering the winner sits in the drivers seat for a national championship bid. Obviously Bama is coming in as the favorite, but I think I'm going to have to put my money on Auburn at home. Bama's offense has looked miserable at times on the road this season. The playoff system will be implemented the season after next, so a game with this much on the line in the BCS system could be the last of its kind. So does this mean I should make a South Carolina Clemson Prediction Thread? How is this Panther's related? 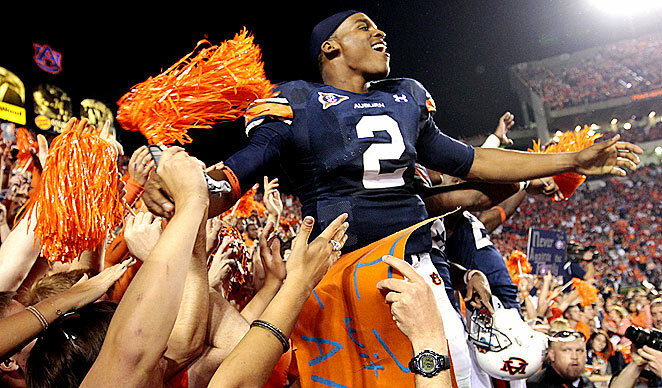 Yes, Cam PLAYED for Auburn, but now he is on the Panthers Roster. This is Cam Newton related, not Panthers related, and I demand that the mod move this thread to the Cam Newton forum. That being said I'm taking Auburn 48 to 42. And here I was thinking there was a college football forum for stuff like this. Our national champion Heisman trophy winning starting QB's alma mater plays the biggest game since he left and became a Panther. So, yes, definitely Panther related! I'll take Belmont in a close one. I'll take Lehigh in a blow out. I'm taking Auburn in the "upset" and I'm taking South Carolina over Clemson.